Hindu Samhati leader Sri Tapan Kumar Ghosh and others freed on bail. The extreme privations of prison life notwithstanding, all the 15 workers of Hindu Samhati, who are with me in the Diamond Harbour Jail, are in high spirits. In the incident of the 12th June night 20 of our workers were injured, eight of them seriously. There was also a lady among those who were seriously injured. Both the police and the administration were complete failures in quelling the absolute rampage that went on at the Hindu Samhati campsite, from 7pm in the evening till 1 am at night. Not only that, the police team - many of whom were seriously injured - took shelter inside the camp to save their lives. If the brave young workers of HS had not fought the bloodthirsty Muslim mob back with a desperate courage, one shudders to think what would have happened. The 8 ladies participating in the camp would surely have been violated and then another Godhra would have been enacted in Gangasagar. 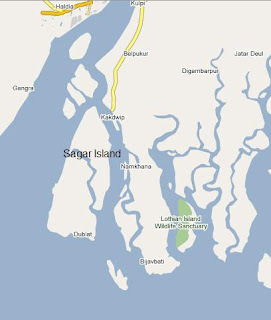 Sagar island at the Gangasagar – the confluence of the Ganga and the Bay of Bengal – is one of the holiest pilgrimages of India, where millions of Hindus from all over India and the world gather during the ‘Makar Sankranti’ (Winter Solstice) for the ‘punya snan’ or holy bath every year. As per the holy Hindu scriptures, this pilgrimage centre was established more than 2000 years ago by Maharishi Kapil (popularly known as Kapil Muni) the chief proponent of 'Samkhya Darshan' or the Samkhya school of thought within Hindu or Indian theology. This remote island gained popular notice in ancient India when Maharishi Kapil set up his ashram in this distant corner to keep away from the attendant distractions of city or village life and meditate upon the novel theories he was propounding. Registered in: New York, USA. The Friends of Hindu Samhati, USA unequivocally condemns today's gruesome attack on the Hindu Samhati training camp at Ganga Sagar (West Bengal) by a murderous mob of local Muslims, at least 6000-7000 strong, starting Thursday (June 12, 2008).